As work on the long-stalled Farm Bill resumes in a Congressional conference committee this week, across the nation, 278 organizations including many in Iowa have signed a new letter calling on Congress to take responsible action for conservation. The groups urge Congress to reconnect taxpayer subsidies for crop insurance to common-sense conservation protections for soil and water–a part of the farm bill known as “conservation compliance.” The letter also calls on Congress to support a national “sodsaver” provision to reduce taxpayer subsidies for converting native grasslands to crop production. Without these key protections, billions of taxpayer dollars spent on crop insurance over coming years will subsidize soil erosion that will choke our waterways, increase the cost of water treatment and dredging, and reduce the long term productivity of farmland. It will also allow for the destruction of tens of thousands of acres of valuable wetlands, resulting in increased downstream flooding, loss of wildlife habitat and decreased water quality. A diverse group of organizations representing Iowans, including the Iowa Environmental Council, have signed the letter. Other Iowa organizations signing include Citizens for a Healthy Iowa, the Des Moines Water Works, the Driftless Chapter of Iowa Trout Unlimited, the Iowa Bowhunters Association, the Iowa Chapter of the American Fisheries Society, the Iowa Farmers Union, the Iowa Natural Heritage Foundation, the Iowa Wildlife Federation, the Izaak Walton League of America, Maquoketa Valley Chapter, the North Bear Chapter of Trout Unlimited, the Quad City Audubon Society, the Spring Creeks Chapter of Trout Unlimited, the Iowa Council of Trout Unlimited, and the Wagner Conservation Coalition. The Environmental Law and Policy Center, a regional organization with offices in Iowa, also signed, as did the Environmental Working Group, whose national agriculture program is based in Ames. The National Sustainable Agriculture Coalition (NSAC) coordinated this national effort. NSAC’s website has the full letter and list of organizations. You can also read about the latest grassland loss data from USDA by clicking here. The Senate Agriculture committee met today to consider amendments to the Committee’s draft Farm Bill. While there are many issues the Council is following in the Farm Bill, our top priority is to re-link crop insurance premium subsidies to conservation compliance as was the case prior to 1996. The Farm Bill that came out of the Senate Agriculture committee today re-establishes that link. An amendment to the Committee Bill by Senator Hoeven (R-ND) that would have stuck the tie between Conservation Compliance and crop insurance failed in committee. So what happens if the Farm Bill expires? In the absence of either a new bill or an extension of the 2008 farm bill, federal price supports for major U.S. crops would revert to their 1949 levels–essentially causing a huge mess. While crop insurance would continue, other programs including direct payments and many conservation programs would end, according to recent Congressional Research Service (CSC) Report. In its place would be a 1940’s era system for supporting agriculture based on crop prices from the 1940’s that do not have any basis in the current market. Some currently subsidized crops such as soybeans and peanuts may not be eligible for any support payments based on the 1940’s law. Another CSC report identifies 37 programs authorized by the 2008 Farm Bill that do not have ongoing funding beyond September 30. These expiring programs include important programs to protect soil and water quality and support for renewable energy, rural economic development and beginning farmers. Of particular concern to conservationists is the expiration of the Wetlands Reserve Program and Grassland Reserve Program which are among the most critical conservation programs for water quality and flood control. What will happen in the lame duck session after the election is unclear, but there are no guarantees that the House and Senate will be able to reach agreement on the farm bill even after the political pressure of the election ends. The Council and its conservation organization partners continue to believe completing a Farm Bill this year is not only important for farmers, but that all Iowans have a stake in the outcome of this critical legislation. Important reforms in the Senate passed farm bill, especially the provision that would re-connect eligibility for crop insurance subsidies to conservation compliance, need to be included in the final legislation. In addition, all conservation programs need to be fully funded to assist farmers in meeting the challenge of increasing production while also improving soil and water quality. The Council will continue to provide updates and opportunities for Iowans to speak out on this critical legislation as the situation develops. Susan Heathcote is the Iowa Environmental Council’s water program director. Yesterday, the Iowa Environmental Council sent an action alert calling on members of the U.S. House of Representatives to oppose a plan to pass a temporary extension of the farm bill that would cut funding for important conservation programs. Opposition to this plan was swift and came from all sides, including America’s largest farm organizations and Secretary of Agriculture Tom Vilsack. Now, the U.S. House has set aside that plan, but may still consider a drought disaster relief bill this week that would be separate from the farm bill. The Iowa Environmental Council will continue to monitor the farm bill and deliver updates and action alerts to our community as appropriate. Thank you to everyone who responded to our action alert quickly yesterday and spoke up in support of passing a complete, reform-minded farm bill this year. Earlier in July, the U.S. House Agriculture Passed its version of the next farm bill, but did so without including needed conservation protections for highly erodible soil, wetlands, and native prairie and grasslands. At that time, we were hopeful beneficial amendments could improve the bill when it reached the House floor–just like took place in the Senate. But now, time is running out to pass a new farm bill given the coming August recess and looming September 30 deadline when the current farm bill expires. The current drought, which is creating serious problems for farmers–especially livestock producers–has also made the situation more urgent. In the last few days, leadership in the U.S. House has hastily pulled together a one-year extension of the farm bill that would provide disaster assistance but also cut funding for important conservation programs and delay actions on critical farm program reforms Congress has been discussing all year. 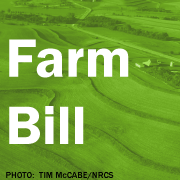 Take action: The Iowa Environmental Council has prepared an action alert allowing you to tell your Representative you expect Congress to pass a full, final farm bill this year. Continue $5 billion in annual spending for the direct payment program the U.S. Senate and House Agriculture Committee have agreed should end in the next farm bill. It is necessary for Congress to provide drought disaster assistance to farmers who need it, but paying for that assistance with cuts to conservation programs that protect the long-term productivity of the land is counterproductive in the long run. In a press release, the National Sustainable Agriculture Coalition, of which the Iowa Environmental Council is a member, said in a statement it “vehemently opposes” the House extension bill and laid out its reasoning in a related blog post.